Everyone wants to have healthy and safe life. But imagine what will happen when you find yourself or your close one having some health issues. What will you do in that situation? But this was no more a tricky question after I met Ferozepur based educationist Sanjiv Sharma who was suffering from diabetes- a metabolic disorder affecting your body’s ability to produce insulin. A known diabetic and skin allergy case weighing 110 kg weight since November 2013 with sugar level of 450, Sharma (44) is presently off the medicines. He is controlling his sugar levels by burning the excess calories by paddling every morning with enviable regularity. Presently running a Primary School – J.K. Convent Primary School since 1997 with 250 students on rolls, Sharma is blessed with a son and a daughter, both in their teens. He worked as medical representative, did tuition work before starting his own school. Sharing his experiences, he recalled how he was diagnosed for diabetes in November 2013 and consulted number of doctors locally including Dr.Harsh Bhola, Dr.Dhingra, Dr.Sethi and Dr.Iqbal. He found out that it was not controllable even with medicines. Being a gritty character he, however, did not lose hope of living a normal healthy life. The turnaround came when he happened to meet Sohan Singh Sodhi who had just started a long distance paddling in January 2014. Initially he started both walking and paddling over the normal cycle and then purchased MTB – Mountain Bike and covered 24 kilometres distance on the first day. It did a miracle and he stopped taking any medicine just after five days as the sugar level in the body came down to normal level as showed by monitoring it on daily basis. 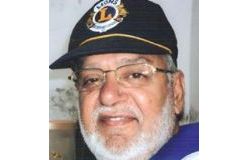 “I can’t forget June 8, 2016 when Sohan Singh Sodhi motivated me for long distance paddling and from 30th June onwards, I am paddling daily more than 50 kilometres. So far, I have completed 6565 KMs with 1500 KMs average per month and my sugar level after meal on an average is 120,” he said. As a message to public, Sharma said, anybody can be diabetes-free if he or she maintains in-take diet and do exercise regularly and the best way is to do paddling as diabetic patient can’t do too much running. “Now I am on normal diet with sweets, to which I am very fond of, I have reduced my weight from 110 Kg to 95 Kg and will further reduce it by controlling my diet and paddling,” he added sharing that he has also advised his son Jatin with 6 feet height is quite bulky with 94 Kg body weight to start paddling to maintain health and to give a pollution-free environment. When asked about the brand of the cycle and its cost, he smiled with a brand name only –Specialized a company of California. 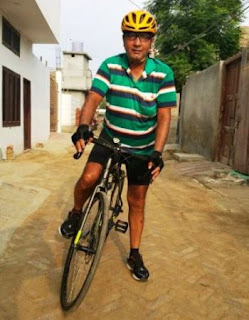 But on myself having a look over the cycle and paddling for a short distance, the cycle is definitely costly, light in weight and can be travelled 30 Plus KMs in an hour, what Sharma told. Last but not the least, Sharma was of the view that with the number of auto vehicles added on the roads every day, the need of the hour is to switch over to paddling for short-distances within the city to maintain health and to keep the pollution-free environment around us. A well known local medical specialist Dr. Awtar Singh opined that in view of likely dangers of blindness, heart attack, kidney failure and amputation, a diabetic patient must consult a specialist to get knowledge about quantum and type off exercise to monitor the diabetes.